Under the artistic direction of David Mandelbaum, New Yiddish Rep produces modern theatre for diverse audiences, tapping into the enduring potency of Yiddish as a language and cultural mindset. The company also combines languages with Yiddish such as English and Russian when such combinations can serve the work and add to its impact. 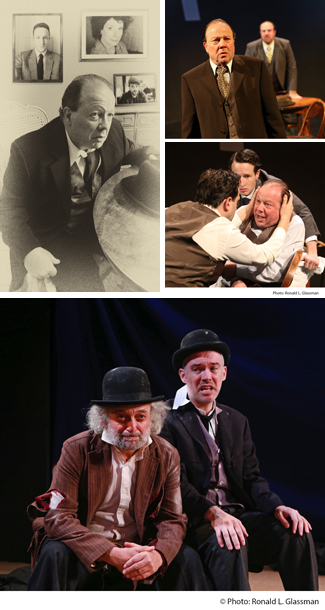 New Yiddish Rep produced the internationally acclaimed and groundbreaking production of Samuel Beckett’s “Waiting for Godot” in Yiddish two seasons ago. That production was said to illuminate a classic of the modern theatre in new and unexpected ways. In the fall of 2015, audiences of all backgrounds began to experience “Death of a Salesman,” the classic of the American theater, in the language that some are convinced reveals its deepest ethical, ethnic and social meanings. The Off-Broadway premiere, produced in association with the multi-cultural Castillo Theatre, ran from October 8 through November 22. The production coincided with Arthur Miller’s centennial is October 17.